A long-awaited new book on personal writing from Phillip Lopate—celebrated essayist, the director of Columbia University’s nonfiction program, and editor of The Art of the Personal Essay. Distinguished author Phillip Lopate, editor of the celebrated anthology The Art of the Personal Essay, is universally acclaimed as “one of our best personal essayists” (Dallas Morning News). 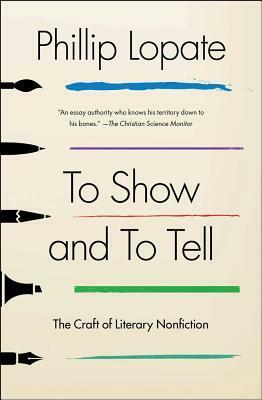 Here, combining more than forty years of lessons from his storied career as a writer and professor, he brings us this highly anticipated nuts-and-bolts guide to writing literary nonfiction. A phenomenal master class shaped by Lopate’s informative, accessible tone and immense gift for storytelling, To Show and To Tell reads like a long walk with a favorite professor—refreshing, insightful, and encouraging in often unexpected ways.